Emergency planning committees for Highland and Fayette counties are pictured during a recent simulated chemical spill training exercise. The Emergency Planning Committees for Highland and Fayette counties held a tabletop exercise on Jan. 24. The annual exercise involved the following agencies from Highland County: Village of Greenfield, Paint Creek Joint EMS/Fire District, Highland North Joint Fire/Ambulance District, Greenfield Police Department, Highland County Sheriff’s Office, Adena Greenfield Medical Center and Highland County Health Department. From Fayette County: Wayne Township Fire Department, Fayette County Sheriff’s Office, Fayette County EMS and Fayette Memorial Hospital. Other agencies that participated were the Ohio State Highway Patrol, Ohio Department of Transportation, EPA and Ohio Emergency Management Agency. The incident simulated a chemical spill at Adient US LLC in Greenfield. The scenario included a hazmat incident with several subjects contaminated with a dangerous chemical. They also had to deal with road closures, hospital notification, and evacuation of the employees, and inform the public of what was happening and how to protect themselves. The tabletop exercise was designed to test the initial notification, Incident Command System, communication, population protective actions, public information, hospital services, and emergency management services. This joint exercise will lead in to a full scale exercise later this year. The Highland and Fayette county LEPC’s would like to thank all the agencies and evaluators that took part in this exercise. In order to receive concurrence for an exercise, the LEPC must demonstrate successfully a majority of the points of review for each chosen objective. The LEPC was successful in demonstrating all chosen objectives and was provided with an order of concurrence. Submitted by David Bushelman, director, Highland County Emergency Management Agency. 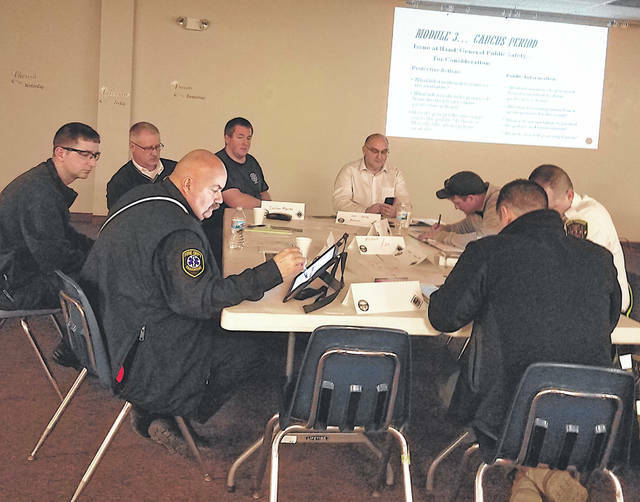 https://www.timesgazette.com/wp-content/uploads/sites/33/2019/02/web1_Emergency-planning-pic.jpgEmergency planning committees for Highland and Fayette counties are pictured during a recent simulated chemical spill training exercise.